This free, hour-long lunchtime show features Ben Morgan, Robyn Perkins and Declan Kennedy along with a guest appearance by Eddy Brimson, who was there to give a taster of his own show. In common with most of the smaller shows at the Fringe, the cast have to turn their hands to publicising the event so as I walked down Victoria Street I was handed a leaflet by Robyn, (who was pleased to hear that I was planning to attend), and having crossed the street to the venue I was shown to the lounge by Ben, where the audience were gathering before the performance room becoming available. First on was Ben, who made use of an envelope marked ‘EMERGENCY JOKES’ whenever he felt audience attention was flagging, although his act flowed well and his punning went down well with the audience. Next, Robyn spoke about her transition from coming to the UK from the USA to gaining British Citizenship and the quirks involved in the process. The third member of the cast was Declan Kennedy, who invoked a bit of audience participation by getting half of the audience to call out “SAY” and the other to call “TON”. Taken together, the audience ended-up calling out something that sounded scarily like “Satan”, which, Declan explained, he hoped would alarm people sitting in the floor above! In the final minutes of the show, Eddy Brimson gave a preview of his own show “Windy Piss”. Hopefully another member of the Counter Culture team will be able to attend and review Eddy’s show as from the taster we got it sounds well worth a look. 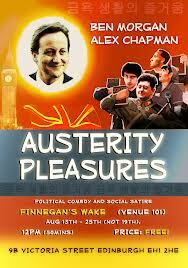 This was the third year that “Austerity Pleasures” has featured at the Fringe and hopefully it will be back again next year. While it was seldom laugh out loud funny, it more than made up for this by having some thoughtful, intelligent observations. The performers were likeable and there seemed to be a good rapport between them and the audience.